The LifeWrap NASG is a lightweight and reusable first aid compression device used to treat shock and manage obstetric haemorrhage. Quantity discounts available. Please enquire. International Federation of Gynecology and Obstetrics’ Committee for Safe Motherhood and Newborn Health. The Non-Pneumatic Anti-Shock Garment (NASG) is a lightweight (1.5kg), washable and reusable first aid compression device made of neoprene fastened with Velcro over a foam compression ball. Once in place, the LifeWrap NASG applies enough circumferential counter pressure to decrease blood loss and reverse shock by increasing blood pressure to the heart, brain, and lungs. In so doing, it reverses hypovolaemic shock resulting from Obstetric Haemorrhage, and has proven effective in stabilizing patients for up to 3 days, while patients are transported to a health center with the ability to administer blood transfusions and provide definitive medical or surgical interventions. To date, it has been used on over 10,000 women in 33 countries. The LifeWrap NASG applies circumferential counter pressure on the lower body and uterus which increases circulating blood to the heart, lungs, and brain and decreases the rate of blood flow in the abdomen and pelvis, thus decreasing blood loss. The LifeWrap NASG has been widely used in countries such as India, Bangladesh, Nigeria, Kenya, Zambia, Zimbabwe and throughout low resource settings in South Asia and Africa, where maternal death rates remain high. It has been successfully deployed to treat postpartum hemorrhage (PPH), often caused by uterine atony, and reduce hypovolemic shock through blood loss, leading to reductions in maternal mortality. 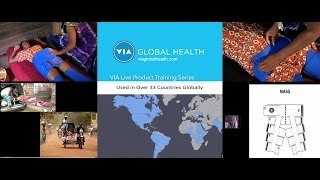 VIA Global Health is committed to reducing maternal mortality rates, and guarantees the lowest in-country prices for the LifeWrap non-pneumatic anti-shock garment. Following a quick training session, frontline health providers are able to successfully apply the garment to the bleeding patient. Once the mother’s bleeding is controlled, she can be safely transported to a hospital for obst care. The anti-shock garment is lightweight, flexible and comfortable for the patient. Importantly, the NASG does not need to be removed for uterine examinations or vaginal procedures, with the abdominal part only being opened for abdominal surgery. The patient’s vital signs often immediately improve upon application. 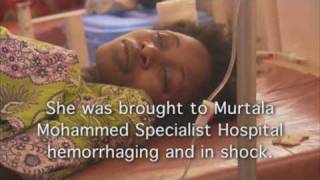 WHO Recommendations for the Prevention and Treatment of Postpartum Haemorrhage. Barriers and Facilitators to Scaling Up the Non-Pneumatic Anti-Shock Garment for Treating Obstetric Hemorrhage: A Qualitative Study. Jordan K; Butrick E; Yamey G; Miller S. (2016) PLoS ONE 11(3): e0150739. The Role of the Nonpneumatic Antishock Garment in Reducing Blood Loss and Mortality Associated with Post-Abortion Hemorrhage. Manandhar S; El Ayadi AM; Butrick E; Hosang R; Miller S. (2015) Studies in Family Planning; 46(3):281-96. A promising device to save maternal lives associated with obstetrics hemorrhage: the non-pneumatic anti-shock garment (NASG). Miller S; Belizan JM. (2015) Reproductive Health; 12:26. Non-pneumatic anti-shock garment for improving maternal survival following severe postpartum haemorrhage: a systematic review. Pileggi-Castro C; Nogueira-Pileggi V; Tuncalp O; Oladapo OT; Vogel JP; Souza JP. (2015) Reproductive Health; 12:28. Cost-effectiveness of the non-pneumatic anti-shock garment (NASG): evidence from a cluster randomized controlled trial in Zambia and Zimbabwe.Downing J; El Ayadi A; Miller S; Butrick E; Mkumba G; Magwali T; Kaseba-Sata C; Kahn JG. (2015) BMC; 15:37. Non-pneumatic anti-shock garment to stabilize women with hypovolemic shock secondary to obstetric hemorrhage.FIGO Safe Motherhood and Newborn Health Committee. (2014) IJGO; 128: 194-195. Per-protocol Effect of Earlier Non-pneumatic Anti-Shock Garment Application for Obstetric Hemorrhage. El Ayadi, A; Gibbons, L; Bergel, E; Butrick, E; Huong, MT, N.Y; Mkumba, G; Kaseba, C; Magwali, T; Merialdi, M; Miller, S. (2014) IJGO; 126(1): 95–96. Non-pneumatic Anti-Shock Garment (NASG), a First-Aid Device to Decrease Maternal Mortality from Obstetric Hemorrhage: A Cluster Randomized Trial.Miller, S; Bergel, EF; El Ayadi, A; Gibbons, L; Butrick, E; Magwali, T; Mkumba, G; Kaseba, C; My Huong, NT; Geissler, JD; Merialdi, M.(2013) PLOS ONE; 8(10): e76477. Use of the Non-pneumatic Anti-Shock Garment (NASG) for Life-Threatening Obstetric Hemorrhage: A Cost-Effectiveness Analysis in Egypt and Nigeria.Sutherland, T; Downing, J; Miller, S; Bishai, DM; Butrick, E; Fathalla, MF; Mourad-Youssif, M; Ojengbede, O; Nsima, D; Kahn, JG. (2013) PLOS ONE; 8(4):e62282. Nurses in Low Resource Settings Save Mothers’ Lives with the Non-pneumatic Anti-Shock Garment. Kausar, F; Morris, J; Fathalla, M; Ojengbede, O; Fabamwo, A; Mourad-Youssif; Morhason-Bello, IO; Galadanci, H; Nsima, D; Butrick, E; Miller, S. (2012) MCN – The American Journal of Maternal / Child Nursing; 37(5):308-16. However, the LifeWrap NASG’s are adaptable to a wide range of women and only on the extremes does sizing matter. How do you clean this device? How should the device be stored? The device should be stored in a cool, dry place if possible. How long does it take to put on? The LifeWrap takes approximately 2 minutes to put on. The Lifewrap NASG carries a factory warranty of up to 2 years for manufacturing issues and the device has been wear tested up to 144 uses by Intertek.